Yallingup might be highly regarded for it’s legendary surf and spectacular coastline, but to those in the know, there’s plenty on offer for the entire family. We’ve explored all options, from 35 metres underground, to 18 metres above ground – no level was off limits! Here are a few of our favourites. All but one of the activities we are about to mention are located within a 10 minute drive of Wildwood Valley Cottages. In local Wadandi language, the word Yallingup is known as “place of caves”, so what better way to start than with Yallingup’s very own Ngilgi (pronounced Nill-Ghee) Cave. Rain, hail or shine, go beneath the surface to marvel at the magnificent labyrinth carpeted in intricate limestone crystal formations. We recommend taking one of the semi-guided tours. After hearing the cave’s fascinating history, you’ll be left at the entrance of the boardwalk-lined cave to explore at your own pace. There’s also a guide halfway through to answer any questions that may arise underground. Semi-guided tours depart every half hour, from 9:30am – 4:00pm. Great for kids 3 and above. While you’re in the area, drop in to Caves House Hotel for lunch in their expansive beer garden. There’s a menu for the grommets and a whole lot of garden for the kids to go wild. Ours loved roly-polying down the grassy slopes, finding the tunnel in the hedge and generally exploring and admiring the flowers. Ngilgi Cave is just a short 10-minute walk through the bush track from the creek line at the bottom of the garden – Caves House was built for honeymooners who began visiting the cave when it opened in 1899. Now a trip to Yallingup wouldn’t be complete without catching a wave. Yallingup is one of the most famous surf breaks in the South West, but don’t let that scare you. There’s a family-friendly break close to shore that is perfect for learning. Yallingup Surf School is where it’s at. Offering both individual and group lessons, for all ages, it’s never too later, or too early, to learn to dance on water. So you’re a few days deep into your trip, and patience is wearing thin. This is where Yallingup Maze is perfect – let the kids run free in the maze or jump to their heart’s content. With multiple mazes, a nature play area, bouncy castle, free puzzles and freshly ground coffee, you can’t go wrong. Yallingup Maze is open from 9:30am – 4:30pm, 7 days a week. This one’s for the thrill seekers aged 7 and above. With six courses, each progressively more difficult, start easy and see how daring you are willing to go. 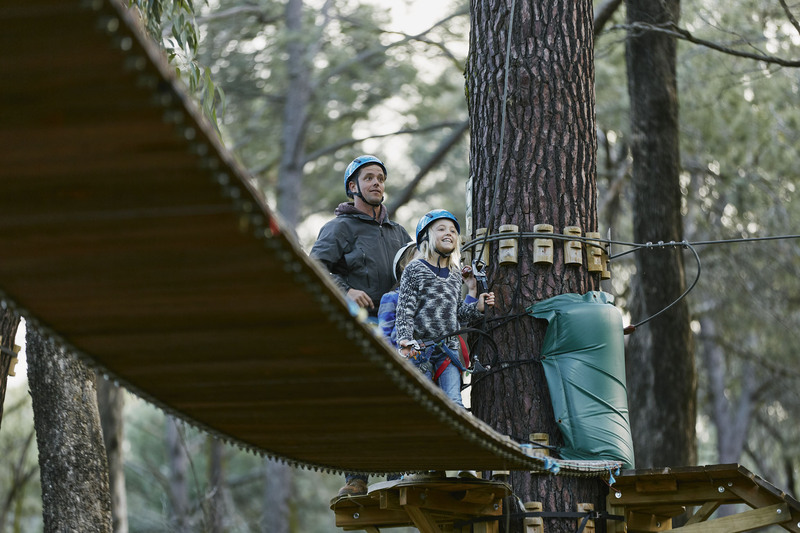 Fly though the trees on the high wire zip line, leap from the base jump 13 metres off the ground and test your strength climbing the high rope course, all between the last remaining Tuart Forest in the world. Forest Adventures is located a little further out of Yallingup, a 10 minute drive north of Busselton, but it’s well worth the drive! A great one to break up the trip home to Perth. Wear enclosed shoes and long trousers. We recommend booking prior to your visit. Open 7 days a week from 9am – 4:30pm. Go bush with Goanna Cafe & Gallery. Quality food set amongst the native bushland, featuring an outdoor play area and a great kids menu. The Indo Rice is a must! Open Wednesday to Sunday, 8am – 4pm. Wine, wood fired pizza, lawn games, vineyard views – need we say more. Swings & Roundabouts is the perfect spot for a lazy afternoon sipping Rosé on the lawn, whilst the kids run amok. Cellar Door open 7 days a week, 10am – 5pm. Finish off with a truly quintessential Yalls experience. Watch the sun go down whilst the pro surfers tackle Main Break from the Yallingup Beach Park. There are BBQs, toilets and a fantastic nature based playground. Looking for more Yallingup inspiration? Check out our Yallingup Guide. And we’d love to have you stay with us – our three larger cottages are ideal for families. Butterfly and Dragonfly Cottages can be configured as 1, 2 or 3-bedroom sleeping 2-6 people. Blue Wren Cottage, our old home, can be configured with 2 or 3 bedrooms and sleeps up to 8 guests. Call us on 08 9755 2120 to book, or book online. No Replies to "A Family Friendly Yallingup Holiday"